Last September, I mentioned how I was honored to coordinate and edit a digital comic in conjunction with the Smithsonian‘s touring “I Want the Wide American Earth” Asian American history exhibit. (And once again, many thanks to Lawrence-Minh Bui Davis and Konrad Ng for allowing me to be part of such an honor). This morning, in a ceremony at the U.S. Department of Labor, Secretary of Labor Thomas E. Perez officially inducted thousands of 19th century Chinese railroad workers into the Labor Hall of Honor. I wanted to share Ming Doyle‘s contribution to the Smithsonian project. 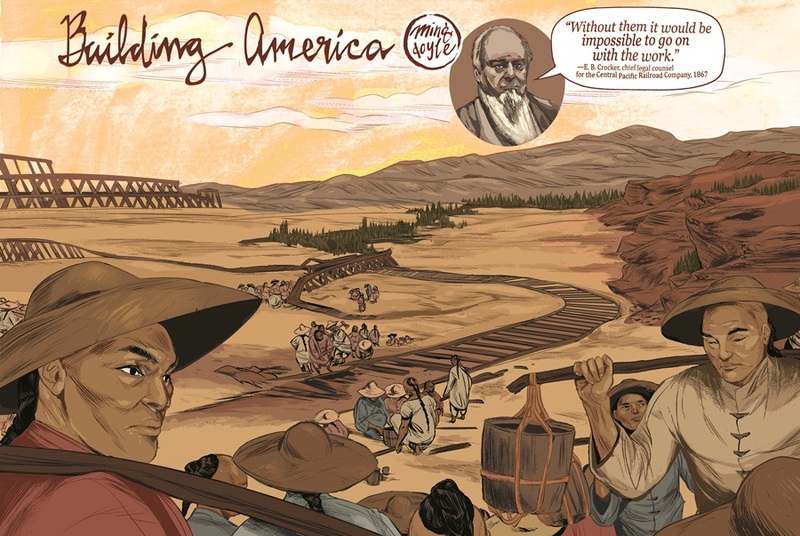 Titled “Building America,” Ming‘s piece depicts the Asian Americans who risked their lives to connect the Transcontinental Railroad between 1865 and 1869. For this accomplishment, for their courage to organize in pursuit of fair wages and safe working conditions, and for the example they set for millions of Asian immigrants who followed them, the Chinese railroad workers will be inducted into our Hall of Honor. Click here for the rest of the Smithsonian Asian Pacific American Center’s digital comic, I Want the Wide American Earth.